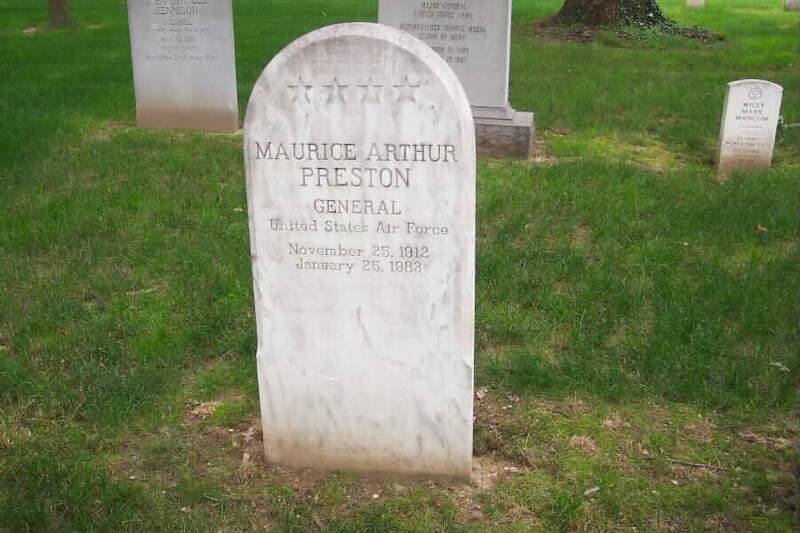 General Maurice Arthur Preston was commander in chief, U.S. Air Forces in Europe, which has the principal mission of training, maintaining and employing the combat-ready Air Force units pledged by the United States to NATO. It is the air component of the unified U.S. European Command. In addition to maintaining a constant alert as a primary instrument of western defense, USAFE provides tactical and logistics support for all U.S. and some NATO forces in Europe, and assists Air Forces of other NATO nations in developing their combat capabilities. The USAFE commander in chief also commands the Fourth Allied Tactical Air Force, the NATO unit to which the bulk of USAFE's combat strength is committed. In time of war, USAFE's mission would be directed by the supreme allied commander, Europe, from Supreme Headquarters Allied Powers Europe. 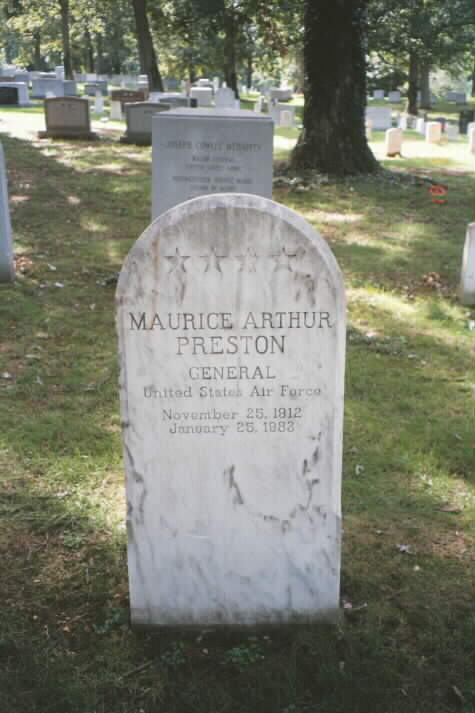 General Preston was born in Weed, California, in 1912, and graduated from high school in Tulare, California, in 1931. After attending St. Mary's College in California, he entered the U.S. Military Academy, graduating June 12, 1937. He completed flying school at Kelly Field, Texas, in October 1938, and then served in various squadron positions before he was assigned as commander of the 62nd Bombardment Squadron at Davis-Monthan Field, Arizona, in 1941. He later became deputy group commander of the 34th Bombardment Group there. In June 1942, he was transferred to Gowen Field, Idaho, and served as deputy group commander of the 34th Bombardment Group and then as deputy commander of the 29th Bombardment Group. In January 1943, he became commander of the 379th Bombardment Group at Wendover Field, Utah. He took the 379th to Europe in early 1943 and flew 45 combat missions in the B-17 Flying Fortress. He participated in the now-historic Schweinfurt attacks, leading the second one on October 14, 1943, which he recalls as "a high point in respect to unit performance." "The yardstick on all of our missions was simple and to the point," General Preston says. "It was basically a question of how many bombs were delivered on target, versus the price we paid in losses." He commanded the 41st Bombardment Wing from October 1944 until May 1945, when he returned to the United States. General Preston was then assigned as base commander of the 231st Army Air Force Base Unit at Alamogordo, New Mexico. He enrolled as a student at the Air Command and Staff School, Maxwell Field, Alabama, in August 1946, and upon graduating in June 1947, became the chief, Inter-American Security Branch and Military Coordinating Committee, of the Permanent Joint Board of Defense Canada and United States, Washington, D.C. He later joined the Plans Division of Air Force Headquarters in Washington, D.C. Going overseas in 1949, General Preston was appointed deputy commander for Plans and Operations of the U.S. Northeastern Command, with duty station at St. Johns, Newfoundland. Assigned to the Strategic Air Command in March 1952, General Preston became commander of the 308th Bombardment Wing (Medium) at Hunter Air Force Base, Georgia. In January 1954 he assumed command of the Strategic Air Command's 4th Air Division at Barksdale Air Force Base, Louisiana. Reassigned to Air Force Headquarters, Washington, D.C., in May 1956, he was named deputy director of operations in the Office of the Deputy Chief of Staff/Operations. He assumed the position of director of operations in August 1957. On July 25, 1960, he became commander of the Tactical Air Command's Nineteenth Air Force, often termed "the suitcase Air Force" because of its ability to move instantly anywhere in the world as the command nucleus and planning elements of the Tactical Air Command's Composite Air Strike Force. He became commander, U.S. Forces Japan and commander, Fifth Air Force, in August 1963, and in August 1966 he assumed his present position. General Preston has logged some 7,000 flying hours in just about every type of aircraft within the U.S. Air Force. He is rated as a navigator and bombardier, and in addition to being a command pilot, he became the first Air Force officer of his rank to go through the Army's paratroop jump school and won his paratrooper's wings in October 1960. In July 1966, his Imperial Highness, Hirohito, the Emperor of Japan, conferred Japan's First Order of the Sacred Treasure on General Preston, then commander of the U.S. Forces Japan and Fifth Air Force. The decoration, one of the highest awards the Government of Japan bestows upon a foreign military officer, was presented to General Preston by Defense Minister Raizo Matsuno and General Yoshifusa Amano, chairman of the Joint Staff Council, Japan Defense Agency. His other decorations include the Silver Star with oak leaf cluster, Legion of Merit with oak leaf cluster, Distinguished Flying Cross with two oak leaf clusters, Bronze Star Medal, Air Medal with seven oak leaf clusters, Army Commendation Medal and the Purple Heart.